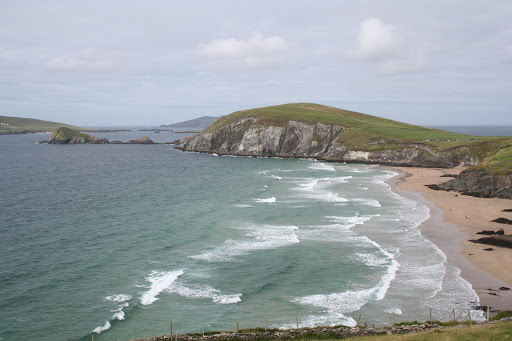 We decided to spend some days in Dingle, County Kerry. Well this is a place that I’ve always had a fondness for and it has been many years since I visited. I made a documentary in the mid-1980s called Up Sraid Eoin (John Street) – it was the story of the Dingle wren boys. We filmed it one St Stephens Day and it was broadcast on RTE the following year. I had been introduced to Dingle while I was working in UCD’s Audio Visual Centre – we spent a whole summer recording stories and music for the Department of Irish Folklore/Irish Folklore Commission. The irony was that we were using television to capture the last remnants of an oral storytelling tradition that was dying out because of the pervasiveness of television. the rhythm of the telling and observe the engagement of the listeners as they fell under the spell of a great story-teller. 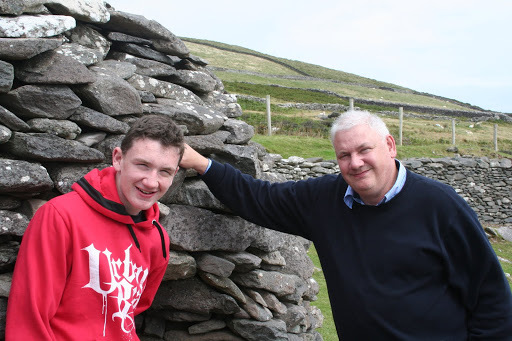 We traveled the length and of Ireland mainly coastal regions and Gaeltacht areas. All this came back when we visited Slea Head on a wonderful day last Friday. 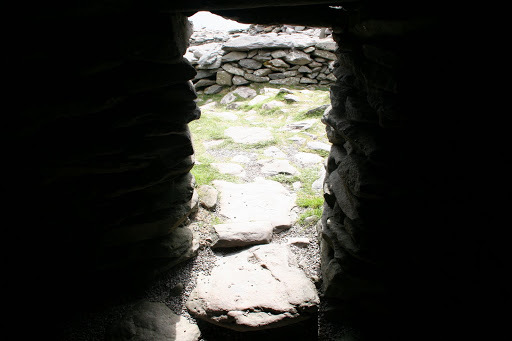 We stopped at the beehive huts – reportedly 2000 BC. The photo is of myself and my son Jim. Folklore in Irish is called bealoideas – literally translated this means education of the mouth. There was a time before literacy when knowledge was passed on between generations using the spoken word. When you think about it stories are a means of engagement and the best stories – the ones that are more likely to be passed through the ages – are the ones that resonate and have meaning for people. Karl Jung pointed this out but it has been known since ancient times. Great stories survive through a kind of evolutionary process. Great story-tellers were highly respected in rural communities that is until television. The Blaskets and Slea Head remind us of our past and the heritage we share with our ancestors – not just those who inhabited the bee-hive huts four thousand years ago but also the people who in my lifetime and in my presence recalled the wondrous tales that are perhaps as old as the stones.